A NEW KIND of Nanny for Summer Months who Will Do All the Work…Curious? I am TESTIMG a Nanny this week to take over while I keep a close watch. She needs 8 bottles of wine…empty. While away it is sometimes a chore to find someone to take care of summer flowers, the Nanny takes over. 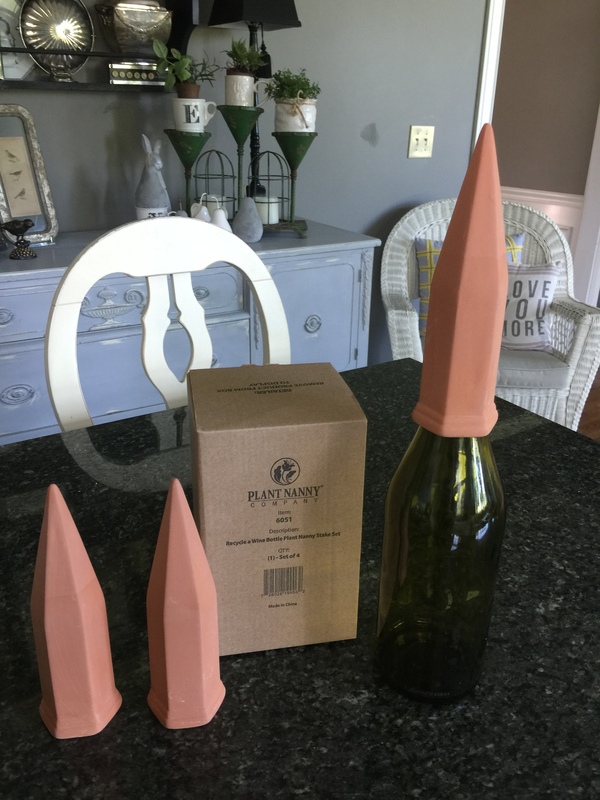 Place clay stake with upside down vino bottle full of water in the middle of the pot of flowers…. and the test begins. 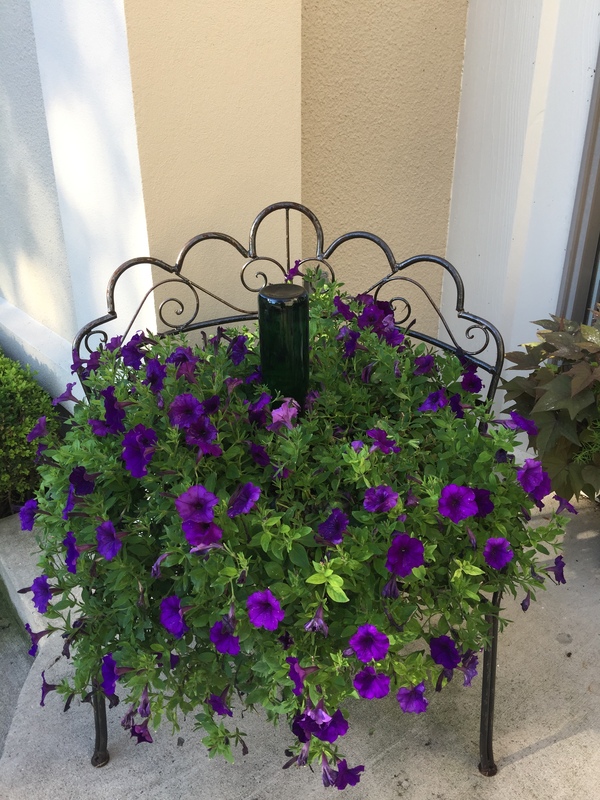 This plant had been full of blooms all summer…so can the Nanny take over while I visit my grandchildren? Testing begins today. 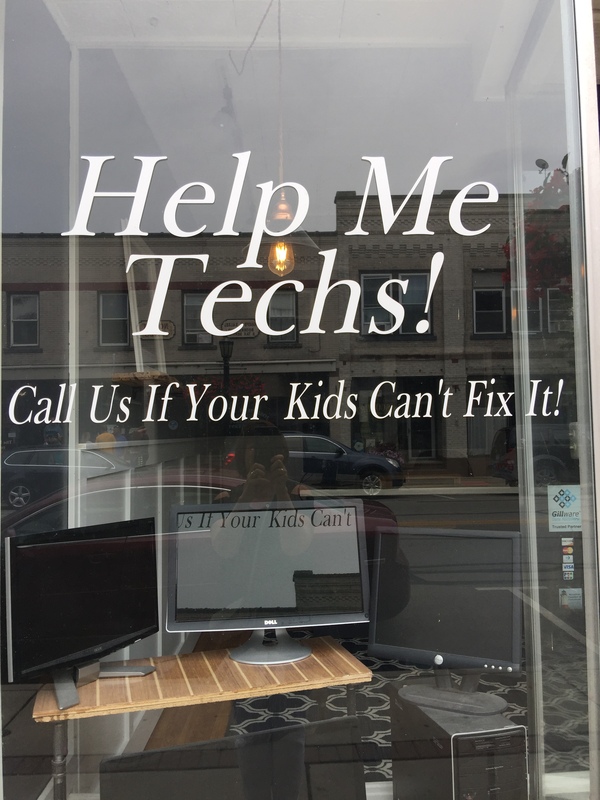 Love the Name in this store front I saw in Vermilion last weekend…So true for me…Andi and Emily are on call almost 24/7 and Lauren our TECH Guru at REMAX Affiliates is an amazing help to me. Speaking of Vermilion, rated as one of the BEST Restaurants in OHIO…Chez Francois…worth the trip! COMING SOON…FIVE easy to follow TIPS that cost NOTHING to transform your HOME to a PRODUCT to Sell! Under PRODUCTION, soon to go PUBLIC. Still CRAZY Market…last three listings went in hours…and now I need more “Merchandise” to Sell. Looking for a 4 Bedroom, 3 Full Bath House in Upper Arlington 600-700K NO HOME SALE Contingency and Lender Approved! Family would love to get in before School STARTS. For a delicious night of reasonably price American cuisine, check out Ella Restaurant. The scallops and pork-chops are incredibly popular. It’s only been open for two months, but Layla’s Kitchen in Northern Columbus is already a local favorite. As the weather starts to get cooler, check out the new Phy Phom Pho for a warm bowl of pho. Dos Hermanos is the perfect place to go in Columbus for lunch or a quick dinner. The chef at Creole Kitchen is one of the most underrated chefs in the area. The food here is absolutely and you will leave completely satisfied. To learn more about the best new restaurants in and around Columbus, visit here. 5 Hot Restaurants Near Westerville, Ohio – Westerville, Ohio is a fantastic spot for finding savory meals. Check out these five hot restaurants around Westerville the next time your stomach starts rumbling. This intimate, Thai restaurant is the best spot in uptown Westerville for flavorful cuisine at a reasonable price. The ingredients are fresh, and each dish is hand cooked from scratch. If you’re looking for authentic Mexican food in Westerville, Yabos Tacos may be your first and last stop. Yabos is known for their unique hot sauces, ranging from such flavors as Strawberry Habanero to Lip Smackin’ Chipotle. In the mood for some comfort food? Try some slow cooked goodness from The BBQ Shack. Often cited by locals as the “best BBQ in town,” this family friendly joint has the best “from-scratch” recipes for sides, as well as the most delicious mouth-watering meats cooked in their giant smoker. This locally owned and operated Italian eatery is sure to satisfy your cravings. With homemade noodles, authentic Italian sauces, and the best pepperoni pizza around, this joint is sure to satisfy your appetite. The name of this popular Westerville diner speaks for itself. Serving up the ideal greasy spoon menu, locals flock to The Best Breakfast and Sandwiches to meet their early morning and midday cravings. This is the ultimate choice for some down-home comfort food. To find out what locals and tourists are saying about these eateries, visit www.yelp.com or www.urbanspoon.com. Another Great Italian Restaurant…and past client treated MOI! Trattoria-Roma…1447 Grandview Ave., Grandview, Ohio…just down the street from another favorite Italian Restaurant I enjoy but Trattoria-Roma is a good match. Actually celebrating a closing that happened five years ago…so nice to see my client again. We both ordered a Scallops and Risotto Dish…so tasty and perfect for a light lunch. I did have one glass of vino but back to the hospital for her so H2O was her drink. Clients always seem to become friends which is one of the best parts of being a Realtor. Starting a busy week…just scheduled flights to PA and CA…that would be Emily and Andi & Mike. Wishing there were more new listings and/or new builds to sell to incoming families. And yes the SUN does shine in OH…IO! Had the pleasure of dining at Ella’s in New Albany. Eat local and love local art is their motto. Small restaurant…atmosphere was minimal… is connected to a small art gallery. Food and service… EXCELLENT! Recommendations include Polenta Fries with Ohio Cheese Fondue, Spinach Pesto, or Spicy Arrabiata for dipping. George who tends to be extremely critical of restaurant food…he should have been a chef…..really liked the Gumbo. I would also go back for Panko Crusted Butternut Squash which was layered with Ohio Cheese…not sure what kind but creamy and very good. And the Carrot Cake was amazing…they do make their own desserts…not a pastry chef but not out of a box that just came from the freezer. It was fun to walk through the art gallery but nothing I needed to bring home…and for those of you that know me, I do like to shop. Ella’s does work with nonprofits, etc. to organize fundraisers for the community. We also tried the recently opened Wine Bistro in Westerville. Enjoyed the great location and atmosphere but the food was just ok. French Onion Soup was good but other items…crab cakes…well, maybe time will help improve the menu. I must admit that George makes the BEST crab cakes ever so maybe I should not order them when I am out. 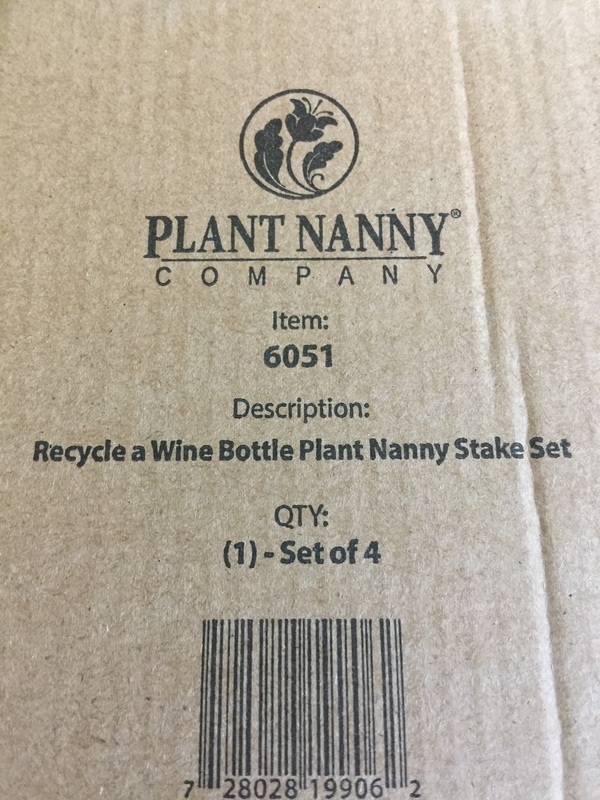 Good news is that you can take your own wine in and enjoy with a small corkage fee….Monday and Tuesday is free. 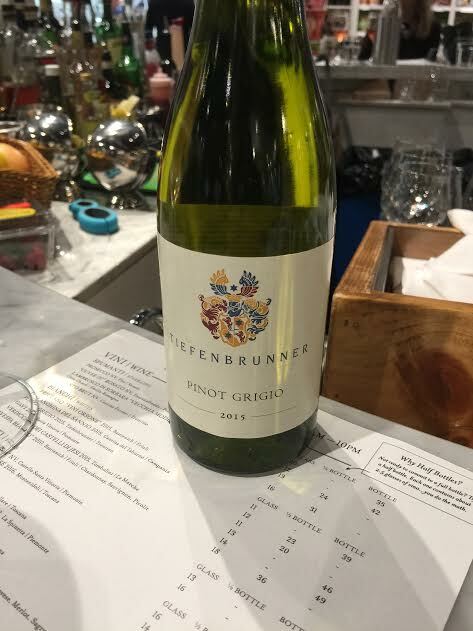 Keep sending the Vino from northern California, Andi and Mike. Waiting for the roads to be cleared and then headed out to preview a property. As you have been hearing on the news, Columbus Ohio homes for sale are far and few between. I never push families to buy, but if you like it, and you want to enjoy the interest rates, buy it today, it may soon be gone. If you are thinking of listing, do it today without much competition from other houses for sale in Columbus Ohio. 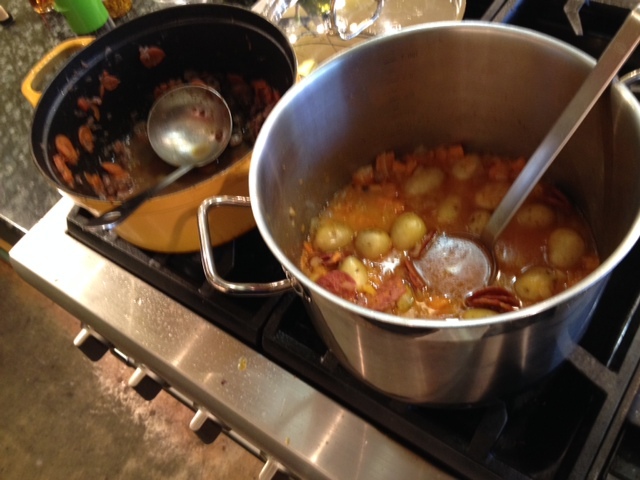 Sur la Table is a great place for cooking classes…The Hearty Winter Soups and Stews class syllabus included four different recipes…all made by our class in 2 hours. Roasted Winter Apple-Squash Soup, Sweet Potato and Chorizo Sausage Soup, Hearty Tuscan Beef Stew, and Chicken Stew with Cannellini Beans, Pancetta, and Leeks. 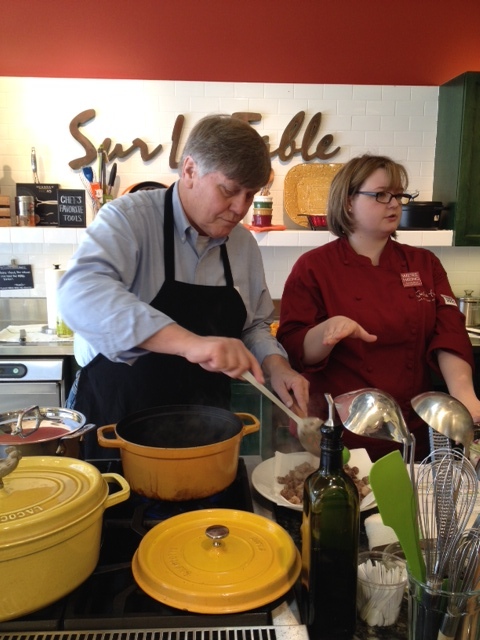 Hands on class which included generous tastings of all four soups. I loved the Apple-Squash and Chicken…Chicken was very different…We are going to try substituting the cannellini beans with barley for a different taste. Let me know if you want any of the recipes. And who says you get too old for Trick or Treat Night. 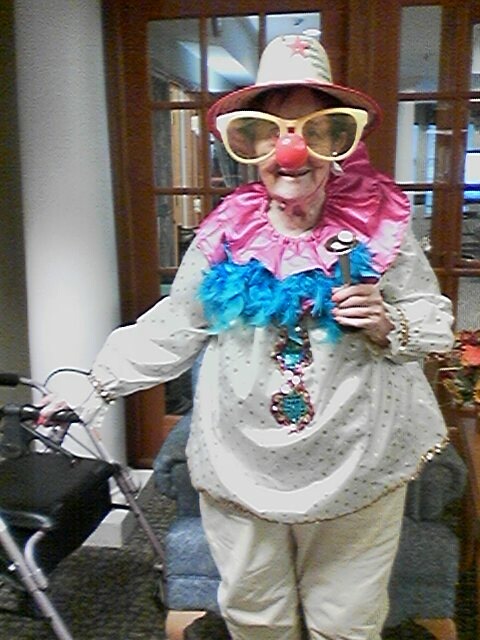 My ninety year old mother in her Halloween Costume as a Clown…She was so excited to see all the children in their costumes. Helping her “downsize” several times has certainly helped me be more sensitive and understanding to my real estate clients as they plan to downsize. As I share, even good change is stressful…so many memories, so many mixed feelings…it is a difficult process. Timing is so critical. But when it is done, all are happy and I can relax. And now on to Holiday Deco. I toured three of my favorite places to get some ideas for the Yanok House this year. So excited that both daughters and our new son will be Home for the Holidays. 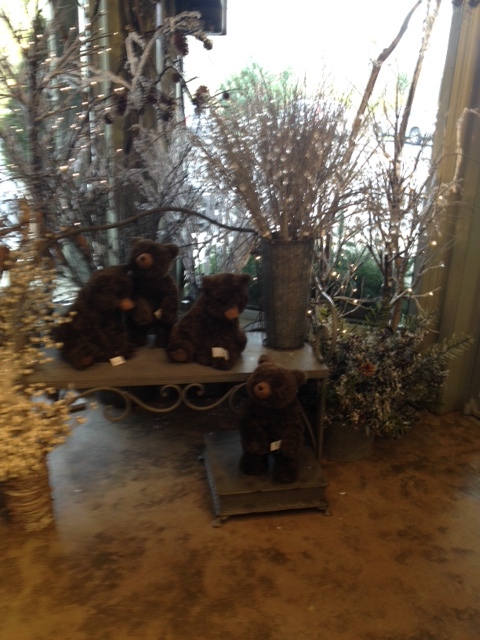 The theme I saw this year, is lots of stuffed, furry animals, and birds…lots of silver and embellished, burlap ribbons. 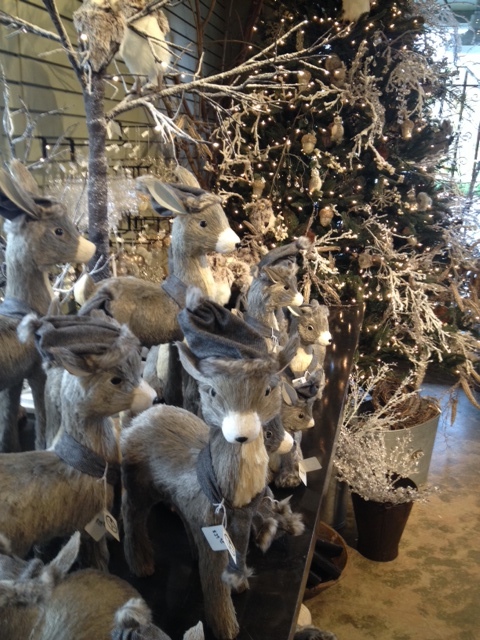 At this time of the year I am gathering ideas as I stop by some of my favorite places between client appointments. Next step is to take an inventory in my very own lower level. I know we have some of our favorite teddy bears…from our children and actually George’s teddy bears…They just might make an appearance this year. Great place to have dinner…The Plate, in New Albany. You will not be disappointed…a farm to table restaurant. Time and Change in this Family…Andi home the last time as Andi Yanok…soon to be Andi Linley. She had to smile when she saw sign at airport at 11:45 PM and around the house. 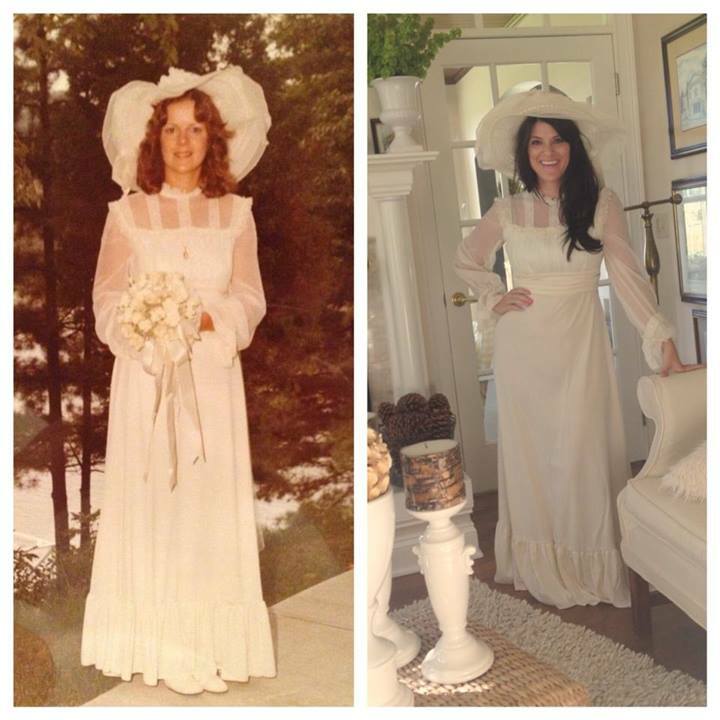 And then the OPENING of my Wedding Dress……packed away for 37 years. 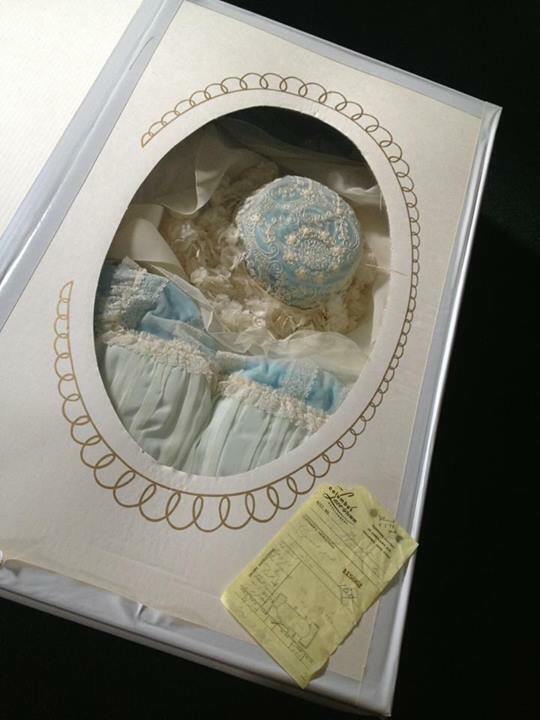 Some tears and some laughter…but a surprise for all…My mother had my dress cleaned, processed, and packaged with seal of protection from the environment at Columbus Lace…so this box has been sitting on a shelf for 37 years. As we broke the seal…stain on one sleeve… and my veil was missing. Sooooooo…yes, Columbus Lace is still in business…BEWARE! And then the fun did begin. The girls enjoyed trying on my Hat from the seventies, etc. Now I had shopped for my MOB dress…after a Short Style Show featuring MOI…I heard comments like, “Mom, you aren’t ready for this yet”, and “You look like an old lady playing Keno in Vegas” so we made a trip to Nordstroms. Love my girls and their opinions. They are my most honest critics…and usually right on target. Back to my Wedding Dress, the ceremony ended, when I cut off 2 sleeves, one for Andi and one for Emily. Andi is using the lace in her Wedding Bouquet. 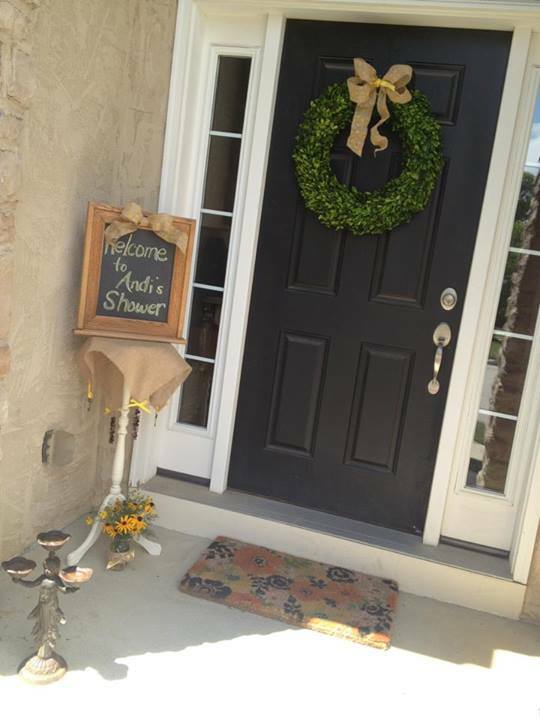 And thank you to Aunt Patti Schmitt, Kim Roe, and Sherri Irwin for giving the most wonderful Wedding Shower. 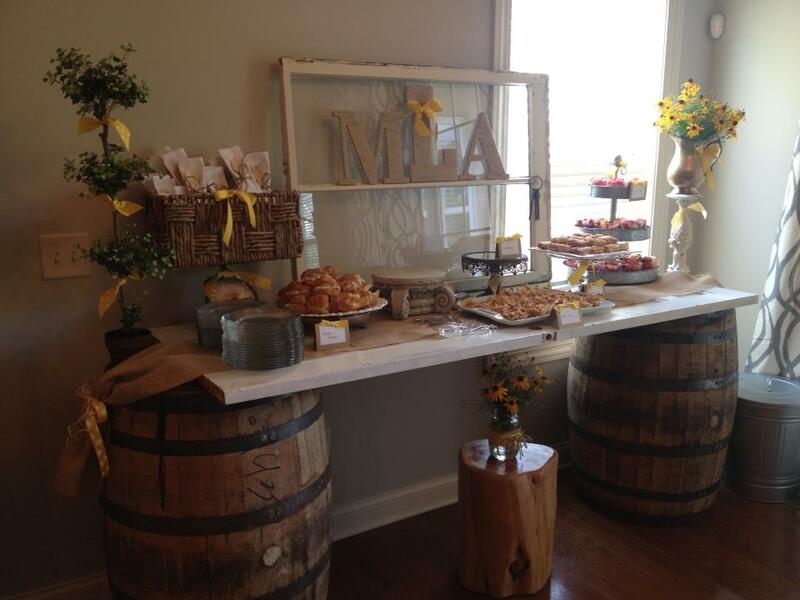 Every detail down to the Whiskey Barrels was completed to keep the theme of Mike and Andi’s CA. wedding at a Ranch. Food was delicious and Aunt Tish brought family and freinds from Canton. Not One Detail Was Forgotten…The Perfect Shower. 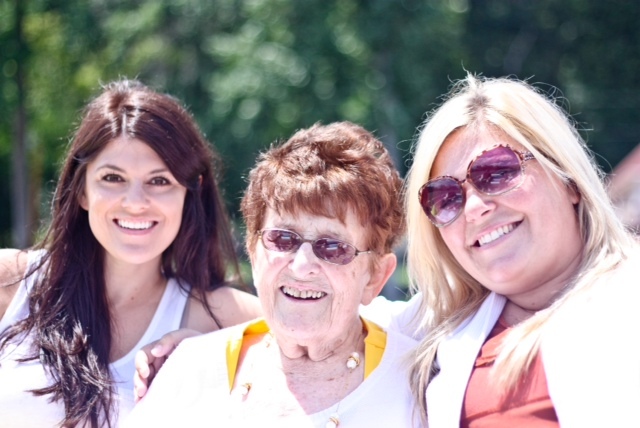 Celebrated my mother’s 90th Bday on Sunday … the end of a beautiful weekend. Not so sad to see them go as I will be seeing them often during the next 2 months. Changing the topic back to Real Estate, there was a great article in the “Columbus Dispatch” last Sunday about Realtors and our role in change. I often remind clients that all change…even good change…is often stressful. New families with children changing schools, leaving grandparents, etc….I try to help eliminate as much stress as possible. Sometimes picking up a current yearbook or school newspaper for a teen to review helps make that first day of school a little easier. Providing a collection of preschool evaluations by former clients can help parents send their first born off to school. 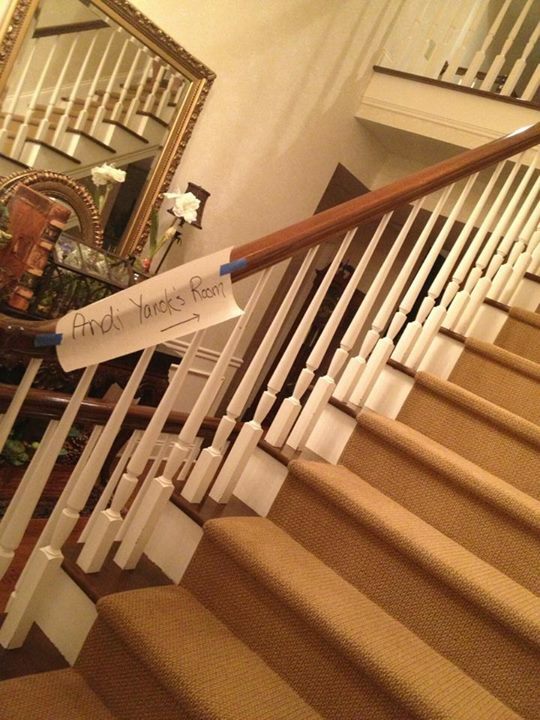 And there are my older clients that are downsizing…leaving a house of memories. There are always some tears and maybe a presigning as opposed to more tears at the closing. But joy does follow when they move to the “new house”, with “new neighbors”, and learn that less is more and they discover a “new freedom”. We laugh and cry…usually more laughter. One that I will always remember was a client that was raised in a house, and then raised her family in this little storybook house…..she is a happy homeowner now…with a section of a kitchen cabinet from the storybook house in her new house…..and I think I suggested this a couple of times as I didn’t want to let go either. Market is changing…Buyers…if you like it, buy it! Inventory is so low. Sellers, if you want to sell your house, now is the time. Contact me for a listing appointment. Quick Restaurant Review… Third and Hollywood in Grandview…I had been wanting to go for a long time…Celebrated our 37th Anniversary there last night. Food was almost the same as NORTHSTAR…but much higher $$$. Northstar does own Third and Hollywood. No reservations, free valet parking but very similar to North Star. Wed.evening, streets in Grandview were busy…so many folks out and about…and not all in line for ice cream at Jenni’s. Grandview Avenue…great little Restaurant Row.